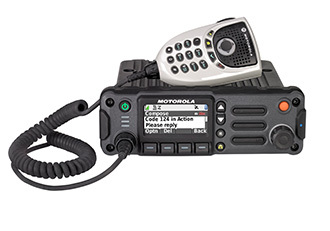 Mayday Communications has grown to be a highly recognized Motorola two-way radio dealer specializing in Public Safety Sector. 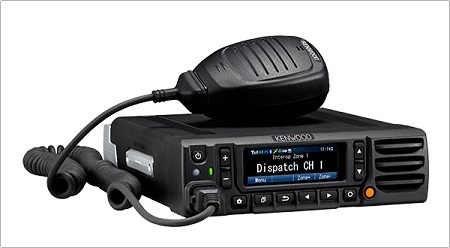 We use only the highest quality radios, batteries, and accessories. That quality is backed up with our fully trained and authorized technicians. As an Authorized Motorola Service Center, we service everything we sell. Our affiliation with Motorola goes back over 5 decades. 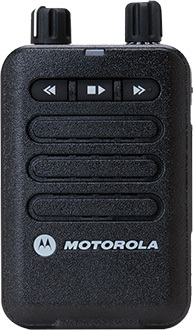 We offer Motorola and Mototrbo portable and mobile two-way radios with outstanding performance and enhanced features for both Public Safety and Commercial use. We also install Firehouse alerting systems, repeaters and voting systems for better communication coverage, as well as in vehicle repeaters for coverage from one frequency band to the other. Security in Schools is essential, and we can improve your communications within your schools campus. You can now reach all of your field personnel regardless of whether they use MOTOTRBO™, ASTRO 25 or a conventional radio system from the MIP 5000 VoIP Radio Console. The MIP 5000 virtual control heads can mimic the control head for MOTOTRBO, ASTRO 25 and conventional radio systems including MOTOTRBO Conventional, MOTOTRBO IP Site Connect and MOTOTRBO Capacity Plus systems. 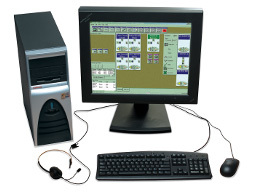 Whether operating a computer in the dispatch center or an advanced device in the field, the MIP 5000 VoIP Radio Console allows personnel and operators to talk, listen and respond wherever a network connection is available. Control up to 24 conventional radio channels. With the look and feel of familiar application menus and icons, the MIP 5000 software is easy to learn and simple to operate. The customizable GUI provides multiple screen layouts to organize resources by agency, shift or other criteria to meet the needs of the user. 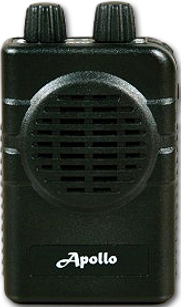 The Apollo VP200Pro1 is the narrowband/wideband programmable version of the original VP200 2-channel voice pager. It features the same rugged, classic styling in a full-size form factor. The VP200Pro1 is also UL-certified for use in hazardous locations. Dedicated function and volume knobs for easy switching. Rubberized, secure-grip sides for improved handleability. Standard AAA NiMH batteries or Alkaline. 8 minutes stored voice, with programmable Squelch Control Record. Heavy gauge polycarbonate housing IP54 for dust and water protection. 100% of pager components available as spare parts. Choose any model that includes your channel frequencies. charger which also features relay, audio, and antenna jacks. 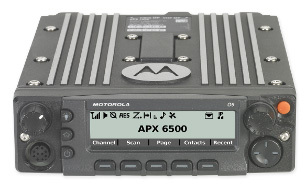 Motorola has taken safety to the extreme with the APX™ 7000XE - their most advanced, rugged radio with innovative features designed by first responders for first responders in extreme environments. Motorola created an ergonomically superior radio that is easy to operate, with glove-friendly controls and a large top display. Significantly louder and clearer audio so that every word is heard. 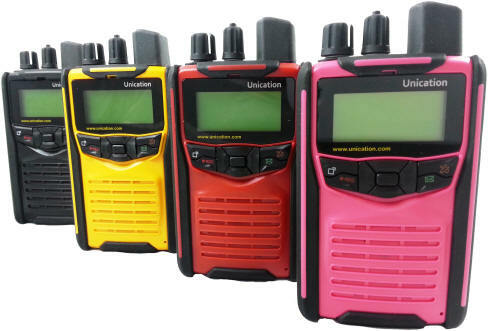 A mission critical multiband, multi-protocol radio so seamless, you can be confident communications are interoperable. Focus on the task, not the technology, with a high-performance radio that stands out in the toughest conditions. The APX 4000 delivers all the benefits of TDMA technology in the smallest P25 capable portable in the industry. Easy to use, tough as nails, a hard value to beat, it seamlessly connects public safety agencies and public works for fast, interoperable communications. You want communication to be continuous - especially during a high-speed chase or lifesaving helicopter rescue. You depend upon every word being heard and every message being understood, with sirens blasting, engines blaring and weather howling in the background. You count on controls that are easy to locate and operate when situations get stressful. And you expect a mobile so interoperable, your personnel can communicate seamlessly - no matter how many agencies or how vast the area. Working with public safety personnel around the world, we designed the APX™ 7500 multiband mobile radio with these must-haves in mind. Whether you want instant interoperability, easy ergonomics or loud, clear audio, the APX 7500 delivers it all, everywhere you go. Racing to an emergency or repairing a power outage, every moment matters as you mount a response. The right control station can make all the difference in making sure communications are clear, continuous and coordinated - across multiple users, agencies and miles. The APX™ 7500 Consolette is the ideal complement to your dispatch console. It's the low cost, mid-power RF control station for the ASTROR 25 system when you want a wireless dispatch solution. Plus, you can use it as an emergency backup station when infrastructure is off-line or for wireless access to different system types for increased interoperability between agencies. 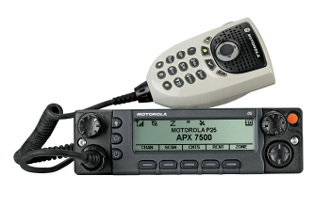 The XPR 4000 Series radios feature an integrated GPS module, alpha-numeric display, four programmable buttons, large volume knob for ease of use and a powerful, front-projecting speaker. Analog Conventional, Digital Conventional, IP Site Connect, Capacity Plus, Connect Plus, LTR/PassPort, Linked Capacity Plus. Operates in both analog and digital modes. Features such as the dynamic mixed mode repeater streamline automatic switching between analog and digital calls - meaning you only need one repeater to operate both modes. Capacity Plus single-site digital trunking system compatible (upgradable at additional cost). Maximizes the capacity of your MOTOTRBO system. Use it to enable a high volume of voice and data communication for over a thousand users at a single site without adding new frequencies. IP Site Connect compatible. IP Site Connect is a digital solution that uses the Internet to extend the voice and data capabilities of MOTOTRBO. Use it to link up to 15 sites for communication among geographically dispersed locations, to create wide area coverage or enhance coverage at a single site with physical barriers (upgradable at additional cost). Linked Capacity Plus compatible. Linked Capacity Plus is an entry level, multi-site digital trunking system configuration for the MOTOTRBO platform. It leverages the high capacity of Capacity Plus, with the wide area coverage capabilities of IP Site Connect to keep your staff at various locations connected with an affordable high capacity, wide area trunking solution (upgradable at additional cost). Transmit Interrupt enables a user to interrupt another radio conversation to deliver critical communication exactly when and where it's needed (upgradable at additional cost). Built-in scrambling for increased security (Enhanced Privacy upgradable at additional cost). The Mag One by Motorola BPR™ 40 two-way radio offers a new choice of affordable communication with a complete assortment of accessories for radio customization. So when your customers select the BPR40, they will experience a reliable, easy to use two-way radio at a great value. You want to connect your workforce as efficiently as possible. You expect your radios to be affordable but flexible, so they can evolve with you. Now there's a portable that gives you great voice communications today, and a path to crisp and clear digital voice communications when you're ready. The 90-Series premium high specification heavy-duty mobiles meet the needs of public safety, public service, government, rail, transportation, utility and private industry sectors are available in dash mount, single head, dual head, dual band and dual head/dual band remote mount configurations. The dual head units are the perfect answer for fire, EMS, supervisor /command post vehicles requiring two full radio control points. The dual band and dual head/dual band allow seamless selection of channels on two different bands. All configurations offer a choice of 8 or 14-character high resolution backlit dot matrix LCD. The controls and customizable PF keys provide an intuitive user interface simplifying operation for all user types. The extra large capacity and dynamic channel group programming facilitate departmental, inter-agency interoperability, mutual aid and tactical channel organization. Encryption /ANI control permits basic to high level voice security and dispatch functions satisfying homeland security and confidentiality requirements. The DB-25 and 15-pin accessory connectors permit interface with data modems, headset/intercom systems, police motorcycle headset/PTT systems for vehicular installations or remote control termination panels for base/control station fixed installations.